Amuse Museum opened in Asakusa, one of Tokyo’s most visited tourist spots, in November 2009 – under the concept of mottainai, well-recognised campaign that aims to establish world peace through environmental conservation, founded by Kenyan Nobel Peace Prize winner Wangari Maathai. Based on the mottainai ideal, the goal of this pioneering museum is to remind us that in making the most of the resources that we already have, we can discover a renewed sense of value – a notion that the museum itself has embraced by refurbishing and setting up shop in a building that was first constructed 45 years ago. Upon first entering the building, one noticeable feature is that the ceiling height is relatively low; however, rather than making the space feel oppressive, it creates a feeling of added excitement – as if walking into a kind of mini amusement park. 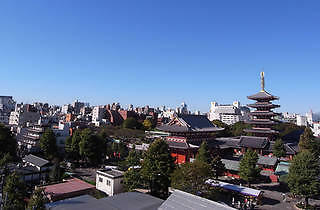 The museum consists of six floors and, in addition to various exhibition spaces, includes spaces in which to drink and dine, such as a bar on the sixth floor and a café on the first floor; an event space reserved for events such as traditional Japanese dance exhibitions and shamisen (Japanese three-stringed guitar) performances; a theatre space, which exhibits historical images of Asakusa; as well as various other spaces that host a diverse range of activities and events. The museum’s permanent collection, entitled ‘Boro’ (a word that is believed to have originated in northern Japan where it was used to refer to the patchwork clothes that people would reuse for generation upon generation by repairing and adding to), includes costumes, props and other antiquated folk art used in ‘Dreams’, the film directed by legendary Japanese director Akira Kurosawa – as well as a selection of letters written by Kurosawa himself. The kimono, boro clothing and film memorabilia alike, have been kindly lent to the museum by the highly respected folklorist Tanaka Chuzaburo, who has spent over 40 years assembling these priceless items. The museum’s Ukiyo-e Theater, located on the sixth floor, presents a chance to better understand and experience life in the Edo period through its exhibition of digital ukiyo-e (woodblock prints) based on the Spaulding Collection from the Museum of Fine Arts, Boston. Apart from the collection, Amuse Museum also boasts something else – a superb view from the roof and from Bar Six, located on the sixth floor. 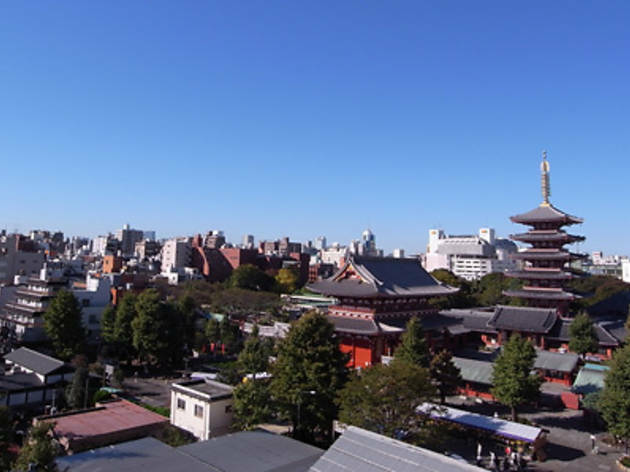 This unique vantage point, which overlooks Sensoji Temple, not only provides an impressive view by day, but also offers a chance to enjoy a glass of wine whilst looking out towards the rooftops of the temple’s illuminated five-storey pagoda by night. Recommended for Skytree-viewing too.